The course that will restore to the workmen a father’s duties and responsibilities, between which and themselves the state has now stepped, is for them to reject all forced contributions from others, and to do their own work through their own voluntary combinations. The ruling idea of the politician – stated rather bluntly – is that those who are opposed to him exist for the purpose of being made to serve his ends, if he can get power enough in his hands to force these ends upon them. 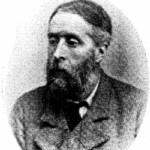 Auberon Herbert was a British writer, theorist, philosopher, and 19th century individualist. He promoted a classical liberal philosophy and took the ideas of Herbert Spencer a stage further by advocating voluntary-funded government that uses force only in defence of individual liberty and private property. He is known as the originator of voluntaryism. Herbert was Member of Parliament for the two member constituency of Nottingham between 1870–1874. He served as President of the fourth day of the first ever Co-operative Congress in 1869.